Hello all, long time no post. Sorry for my absence, but I’ve been extra busy lately and when I’m done for the day I crash where ever I may be standing. I wanted to share with you a photo of the project I made for this month’s UStamp event. The theme was “Big Shot, Projects to Die For”. Our project was to be created using the Big Shot Die-Cutting Machine. 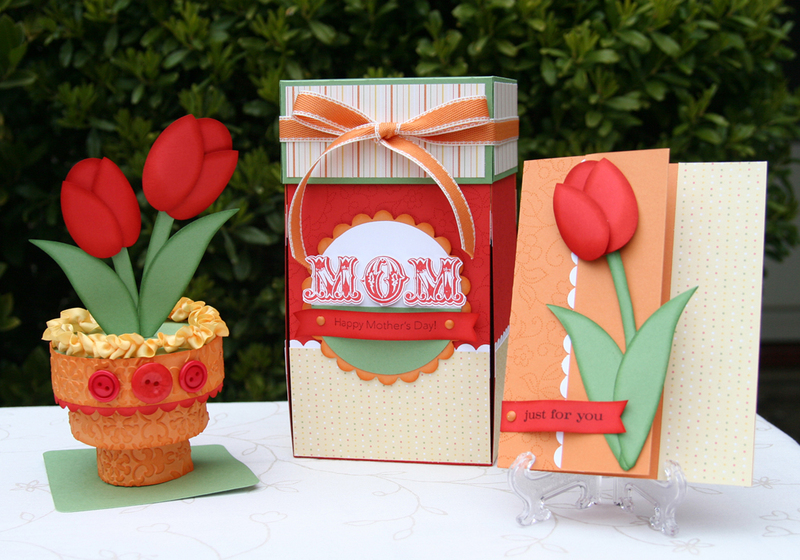 I can’t go into much detail, but I will tell you that the flower pot is made using the Pop-Up Birthday Cake die. To get a full photographic tutorial for this and 39 other great projects click here. In the photo you can see all three elements, but when given to the recipient, the flower pot would be inside the box. Hope this inspires you to create something wonderful for someone special! Totally Awesome!! I love the Tulips in the pot.